When you’ve got the right creative tools, the world (or the webpage) is your oyster. Master the tools that professional designers use for just $29—the Complete Adobe CC Training Bundle is now 95% off at the Mary Sue Shop. Flash is an awful technology for displaying Internet content for multiple reasons, but it's still a tool that a lot of animators use to make videos that we then watch in HTML5 video instead. If you needed yet another signal that Flash's reputation has gone down the (series of) tubes, Adobe is renaming the authoring tool to disassociate it from the actual content format. Using tech to manipulate women more to your liking? Ew. To demonstrate the new iPad Pro's processing power, they had a representative from Adobe use Photoshop on the iPad Pro to digitally touch up some photos of a woman for a magazine spread. 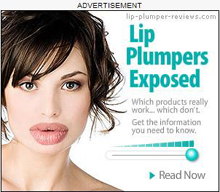 That touching up involved manipulating the photo to "just give her a little bit more of a smile." "Gamergate is misogyny!" "Gamergate is about ethics!" Gamergate is... confusing. I don't think anyone can deny that last one, least of all Adobe, which became the most recent company to unwittingly get caught up in the controversy. First, they appeared to support Gamergate, and now they're distancing themselves from it. You might be wondering what kind of doublespeak inanity is going on when tech giant Adobe's announcement that they're acquiescing to GamerGate requests is accompanied by an anti-bullying graphic, so allow us to explain. It's a series of unfortunate events. Microsoft typically gets a bad rap from the security community. To be fair, the company's history hasn't exactly been full of reasons for folks to think that they're terribly secure, but perhaps that's all about to change. Kaspersky Lab, one of the major worldwide IT security companies, just released their IT Threat Evolution report for the third quarter, and Microsoft's managed to not be included at all in the top 10 products with vulnerabilities. Seriously. The Internet may have mostly made it past the phase of popup ads, though they certainly still exist in dark corners of the web, but it turns out that online advertising may not be out of the woods just yet. According to a survey conducted by Adobe, consumers pay more attention to radio ads than they do online ones. The only kind of ads that polled worse were those that show up in apps and games. Even more amusing than that is the fact that 53% of those surveyed thought that "most marketing is a bunch of B.S." Being able to print your own gadgets, gears, and gizmos at home from a 3D printer has the potential to revolutionize DIY culture and bring it into the mainstream. 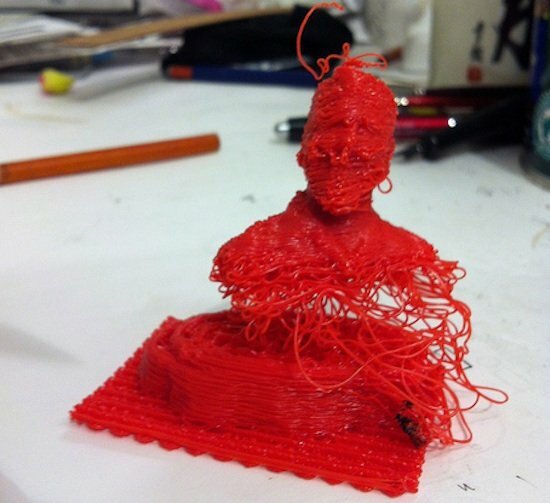 However, the technique, popularized by MakerBot Industries and others, still has flaws. For one thing, the models created by 3D printers, while impressive, are less than structurally sophisticated. They don't handle high levels of stress very well, and the points where a model is most likely to be gripped or push against another object can weaken and break. A new piece of software from Purdue University and Adobe could solve that trouble by automatically scanning designs for 3D models for structural weak points and then reinforcing them as the model prints. Adobe, the makers of such beloved software as Photoshop, is announcing their latest bundle of artistic software today: Creative Suite 6. While it will feature new tools and improvements over the older versions, the biggest news is that the software will now be available on a subscription basis and feature cloud storage, synching, and editing options. Image manipulation wizards rejoice! 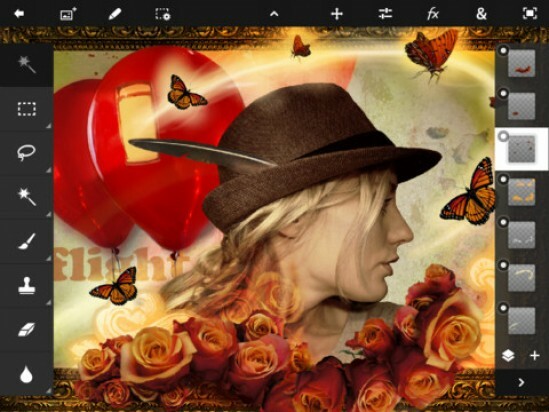 Adobe's mobile Photoshop, Photoshop Touch, has now released on the iPad 2, for a paltry sum of $9.99. Your device has to be updated and running iOS 5, or else the app won't be compatible. This version of Photoshop takes core features from its big brother and stuffs them into the tablet, so you can touch up pictures by adding aliens into the background on the go. 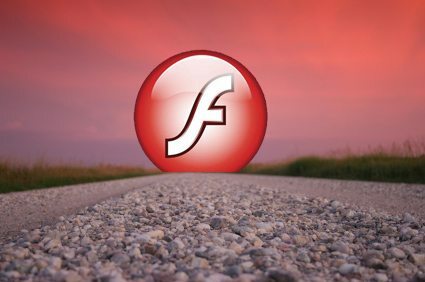 Occupy Flash, a weirdly misnamed movement presumably riding on the coattails of the much more appropriately named Occupy Wall Street movement, is encouraging users to unequivocally uninstall Adobe's Flash player. It all comes back to the fact that Adobe has recently ended mobile Flash development in order to head in a more HTML5 direction. 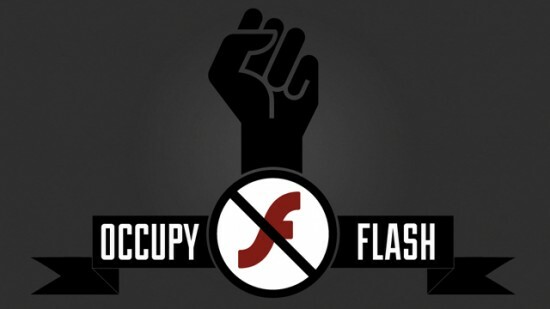 That being the case, Occupy Flash supporters are uninstalling Flash in hopes of forcing Adobe in a more HTML5 direction. Because it's certainly not headed that way already. No, not at all. Adobe has announced that, from here on out, they will no longer be supporting Flash for mobile devices. After the release of Flash Player 11.1 for Blackberry and Android, there won't be any new revisions to support future OS verisons or browsers or anything. Mobile Flash is dead in the water. Adobe will hop back in there to release some "critical bug fixes and security updates," but other than that, Adobe is leaving mobile Flash to focus on -- you guessed -- it HTML5, which is more universally supported on mobile devices. PC Flash is still totally a thing though, of course, and Adobe is already at work on Flash 12. For your mobile devices, however, you can wave goodbye as Flash rides off into the sunset. CSI has made somewhat of a meme (no, not the sunglasses) out of image ENHANCEment, and people knowledgable on the subject have done a lot of work to explain to us that it is not how image enhancement works. Adobe, ever the photo-editing pioneer, is aiming to change that, and with the unveiling of their new unblurring algorithm, it seems that they have taken great strides toward the CSI fantasy. The unblur feature was shown at Adobe's MAX 2011 where it was used to clarify a blurry picture of a crowd at what appears to be a mall. The algorithm actually calculates the movement of the camera during the time the shutter was open and uses it to retroactively correct the blurring that occurred. Impressive. Perhaps as shocking as the unblur feature itself was the crowd's reaction. Immediately after the demonstration, there were first gasps, then applause, then several shouts of "That's impossible" and "H-how does it do that?" No word on when the feature will be available to the public, but it has to take some serious computing power. Still, it's an incredible advancement. We are living in the future, my friends. Video after the jump. Watch it. Really. It's a little shaky, but the crowd reactions alone are worth it. The focus for this initial version of Wallaby is to do the best job possible of converting typical banner ads to HTML5 and supported Webkit browsers include Chrome and Safari on OSX, Windows, and iOS. As those of you following the new MacBook Air may know, Apple decided to ship the wafer-thin laptop without Adobe Flash, yet another log into the Apple-hates-Flash fire. However, instead of excluding Flash for no other reason than keeping with the anti-Flash trend, reviews of the MacBook Air over at Ars Technica indicate that having Flash installed can cut the battery life by a third, providing a possible practical reason as to why Flash didn't make the cut. 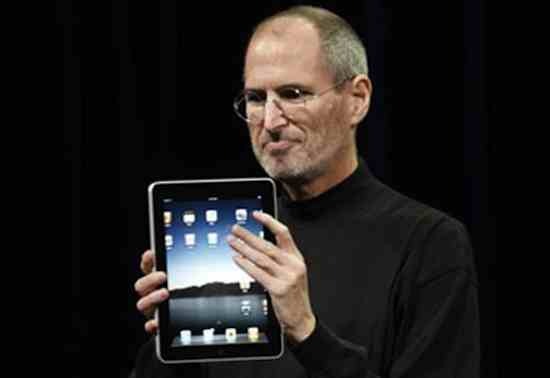 Ever since Apple began taking over the world, Adobe's Flash has been under a lot more scrutiny, considering Apple overlord Steve Jobs has openly decried it in favor of HTML5. 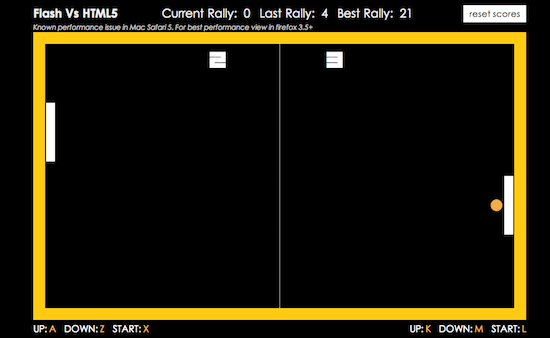 There's been a lot of buzz surrounding the Flash vs. HTML5 debate, so the team over at Code Computerlove decided to put it to a more practical test: Flash vs HTML5 in the form of Pong, with the left side being Flash and the right side being HTML5. 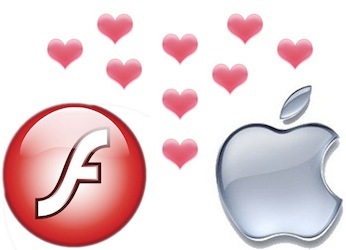 Apple Eases iOS Development: Flash Finally Allowed? A statement released on Apple's website today explains that they'll be easing up on all iOS developmental tool restrictions. The tech world is hyperventilating today over Google's and Verizon Wireless' big reveal of an official website for the Motorola Droid X, which isn't at some viral hole-in-the-wall URL, but is located on Verizon Wireless' website. Motorola, Google, Verizon Wireless, and Adobe haven't yet put out an official press statement announcing the phone's launch or detailing its specs, so the smartphone is still shrouded in mystery; it is expected to be revealed at a press-only event on June 23rd. As pumped as Android fans are about the Droid X, which has all the makings of the next flagship Android phone, there's one detail on the website which seems too good to be true to some: If you roll over the picture of the Droid X on the site, you'll see the above display, which promises a 720p screen. Update: This must have been a mistake. The screen has been changed. This isn't just an HD screen; it would, by some metrics, make the Droid X a stronger phone for viewing visual content than the iPhone 4, with the so-called "retina display" that Steve Jobs somewhat dubiously claimed made it sharper than the human eye could perceive. 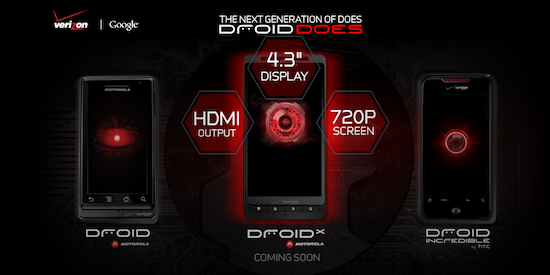 Is this a game changer, or will the Droid X deliver less than it seems? Since that golden era, the companies have grown apart. Apple went through its near death experience, and Adobe was drawn to the corporate market with their Acrobat products. Each of the two companies has known multiple iterations. Apple has had three: the Jobs (and Wozniak) era ('76 - '85), the non-Jobs era ('85 - '97) and the re-Jobs era ('97 - now). Adobe, two: the John Warnock/Chuck Geschke era ('82 - '00), and the post-Warnock/Geschke era ('00 - now). The "golden era" Jobs refers to above encapsulates a large part of that 1982 - 1985 overlap (and somewhat beyond), with the development of PostScript, the Macintosh, and the Apple LaserWriter. The companies built desktop publishing in concert: Apple, the hardware side, Adobe, the software. The critique Jobs makes in the quote above is acidic.